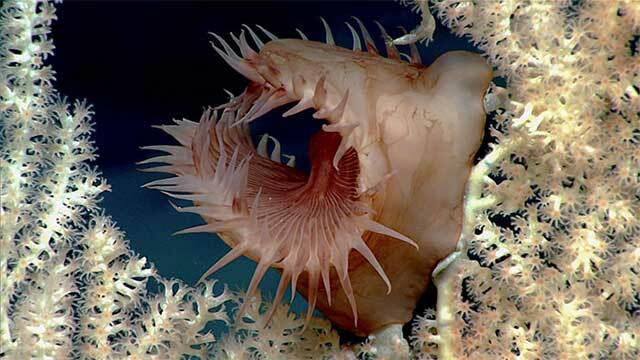 The team aboard NOAA Ship Okeanos Explorer have just completed the Mountains in the Deep expedition. 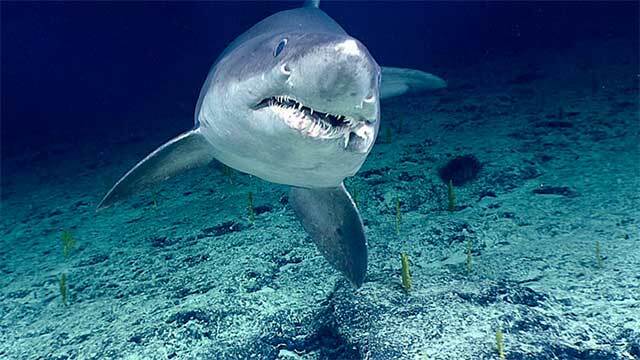 Smalltooth sand tiger shark at ~1,025 meters (~3,360 feet) of depth on Kingman Cone. 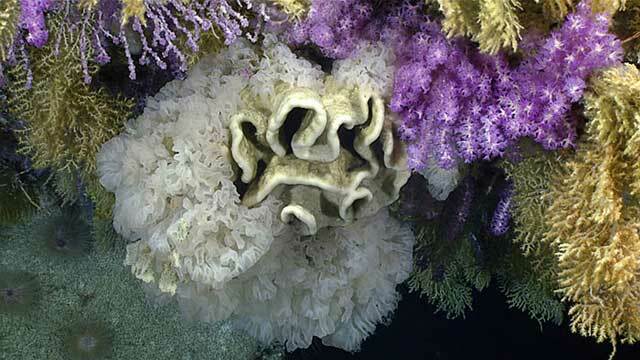 Throughout the cruise, the at-sea and shore-based science teams encountered unexpected deep-sea coral forests, unusual creatures of the water column, rare acts of predation and more. 2017 marks the third and final year of the Campaign to Address the Pacific monument Science, Technology, and Ocean NEeds (CAPSTONE). The Okeanos Explorer plans to explore the Johnston Atoll Unit of the Pacific Remote Islands Marine National Monument and the Musician Seamounts, located northwest of Hawaii, later this summer. Live video feeds will be available to anyone online, providing you with a front row seat to discoveries as they are made. 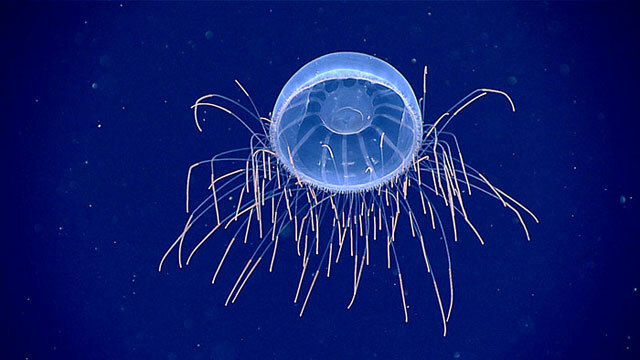 Hydromedusa, Halicreatis, at about 1,200 meters (3,935 feet) depth. The ends of its tentacles are packed with nematocysts (stinging cells), which make them appear especially bright. The Central Pacific Basin encompasses some of the most remote areas on Earth. Large swaths of this region have previously never been mapped using high-resolution mapping systems and the vast majority of these waters remain unseen by human eyes. This expedition collected critical data to better understand the origin of seamounts in this area and how deep-sea communities are connected. An unusual umbrella-shaped pedestal that was covered with corals and sponges towards the end of Dive 05 of the expedition. Zooming in revealed numerous shrimp, crabs, brittle stars, and fish living within this structure. How much the Okeanus Explorer can contribute to our knowledge of the deep seas next year remains in doubt, as the Trump administration proposes a 46% cut to NOAA’s ocean exploration. 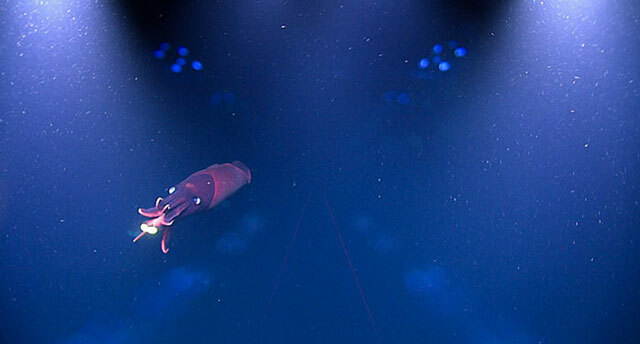 Images courtesy of the NOAA Office of Ocean Exploration and Research, Mountains in the Deep: Exploring the Central Pacific Basin. More images and videos are available on NOAA’s site.